SALISBURY — Jonathan Blackmer traveled to Chestnut Hill Cemetery Monday and placed fresh flowers at the gravesite of his mother, Suzanne. It would have been her 104th birthday, a day Jonathan always associates with the start of spring. 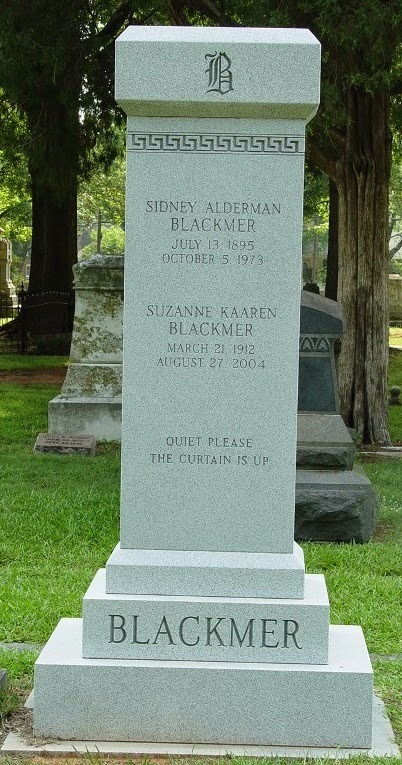 The tall stone marker for actors Sidney and Suzanne Blackmer includes the traditional command of a stage manager in the theater: “Quiet please. The curtain is up.” Before Sidney had died of cancer in 1973, he had told Jonathan it was the inscription he wanted engraved on his headstone. It’s fitting, of course, for both Sidney and Suzanne. The flowers Jonathan placed at the foot of the tombstone made him think of the long war his mother once waged with Donald Trump — yes, that Donald Trump, the man running for the Republican nomination for president. After more than a decade of litigation and trying to force Suzanne Blackmer out of her rent-controlled apartment at 100 Central Park South — an address that was as ritzy as it sounds — Suzanne triumphed and was able to stay. Jonathan remembers how Trump’s people “dragged her into court” at every opportunity and how often she stood up to them alone. More amazing than her victory was how Suzanne forgave Trump after it was all over and how Trump showed his respect for her. On every birthday until Suzanne’s death in 2004, Trump sent her flowers and a card. Blackmer says he’s looking for the proof in past newspaper articles, but he is sure his mother was once quoted as saying Trump was a man of vision and she thought he could or should run for president. Suzanne Kaaren Blackmer was a Ziegfeld Follies girl, who would go on to appear in more than 66 movies and in several stage productions. Her beautiful legs, described as the “Toast of Broadway,” were once insured for $1 million. She married Sidney Blackmer in Hollywood in 1943. They first rented the Central Park South apartment in 1945 and often split their time between New York and Sidney’s hometown of Salisbury, though they considered Salisbury home. It’s where they mostly raised their two boys, Brewster and Jonathan. The couple were true darlings of Salisbury, and everyone identified them with their stately home at 112 S. Fulton St. But Suzanne ran into bad luck after Sidney’s death in 1973. The couple’s wealth had been decimated by bad investments and Sidney’s fight against cancer. Suzanne found it difficult to maintain her huge, historic home, and things became even more desperate when a 1984 fire — not covered by insurance, because it had lapsed — seriously damaged the home. Suzanne fought city government and neighbors who wanted the house torn down. She lived in the big garage in back with much of her memorabilia, while her pipes froze in the winter, forcing her to shower at the YMCA. Suzanne eventually returned to the New York apartment, which had three big windows looking onto Central Park, with Tiffany’s just around the corner. She was on the third floor of a 15-floor building. Based on her age and income and because of New York rent controls, Suzanne Blackmer paid only $203.59 a month for the two-bedroom apartment. Her income at the time was less than $10,000 a year, representing the money she received from Social Security, a small Actors’ Guild pension and even some occasional work as an actress. Trump entered the picture after he bought her building and its 86 flats. One reason he purchased the property at a bargain price was that many of the building’s tenants were in rent-control situations, so it was unprofitable for the former owners. Other similar apartments were renting for $5,000 a month. Trump also knew he could sell them for $1 million each as condominiums, so it was his argument Suzanne should pay fair market value or get out. His lawyers first asked the Department of Housing three times to evict Blackmer, arguing her real home was back in Salisbury. They lost three times, appealed to the courts and lost again. But by December 1986, the Trump lawyers had persuaded officials her real home was in North Carolina, even with the fire and despite her house’s unlivable condition. So Blackmer found an attorney, Marc Finklestein, a law professor at the Brooklyn Law School and director of the Brooklyn Legal Services Office for Senior Citizens. At one point in 1987, a law enforcement officer came to her apartment door with a piece of paper, giving her 72 hours to move out. Her attorney successfully fended off that eviction attempt. British writer Nick Davies, who authored a long Sunday magazine piece on Trump in December 1987, mentioned Suzanne Blackmer’s fight against the developer. In 1998, an appellate court ruled that Trump could turn the apartments into condos and sell them — Suzanne Blackmer’s apartment was assessed at $750,000 — but Suzanne and other rent-control tenants could stay if they wanted with the New York rent controls still in effect. Today, as his mother did years ago, Blackmer shows a tremendous capacity for forgiveness toward Trump and the people who worked for him. There were times, he recalls, when they made it difficult for his mother in her apartment by cutting off the water and power — and blaming it on the renovations going on elsewhere. There also was some harassment by the doorman and building superintendent. But Jonathan doesn’t think Trump directed the hard tactics or was ever malicious toward his mother. “He’s a businessman, and that’s what they had to do,” Blackmer says. Trump read those words and wrote her a note. Blackmer told the Post in 2000 she loved that note and kept it. She stressed her fight with Trump was in the past. The Blackmer House in Salisbury was saved. Jonathan ended up selling it to Historic Salisbury Foundation, which in turn sold it to Glenn and Beth Dixon. The Dixons finished a complete restoration last year. Suzanne Blackmer continued living in her New York apartment until she contracted pneumonia. Jonathan made sure she was hospitalized, and when she began getting better, he moved her to the Lillian Booth Home of the Actors’ Fund of America in Englewood, N.J., for rehabilitation. Suzanne Blackmer never made it back to her apartment. She died Aug. 27, 2004, at age 92 and was buried with her husband in Salisbury. Jonathan Blackmer said he spent a year cleaning out his mother’s New York apartment, then mailed the keys to Trump — or Trump’s people. The curtain came down on the story of a feisty little actress and the billionaire developer. Winning can be a complicated thing. After a year-long, self-imposed exile from the pages of the Salisbury Post, I return because I have something to share. Something which was shared with me. Recently, while having my filamentous outgrowth pruned (I was getting a haircut), long-time friend Davey Overcash mentioned he had been going through an old family storage trunk and had found a stack of newspapers from the fabulous Fifties. 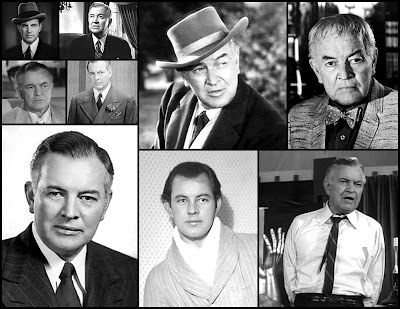 Included were several articles about Sidney Blackmer, Salisbury native and renowned actor of stage, radio, movies and television whose career spanned six decades. “Would I like to have them?” he asked. Does the sun rise in the east? Of course I would. Seems Davey’s mom was a Blackmer fan, as am I, and had kept these nearly 60-year-old newspapers. I’m glad she did. The words are not mine (I was but 6 at the time it was written). They belong to a gentleman who visited the actor at his South Fulton Street home, and Blackmer himself. I find it to be a very insightful and informative discussion and how wonderful it is to discover it now, nearly 60 years after it occurred. The article which follows was published for the first time in the Feb. 17, 1957 issue of The Daily Independent Magazine and was written by Bill Maultsby. From Rowan County to Hollywood is a distance of some 3,000 miles — and from Salisbury to New York City is a far piece in itself. But Sidney Blackmer is one Rowan County resident who makes both trips quite frequently and always manages to find the road back to Salisbury. That is because Sidney Blackmer loves Rowan County as he loves no other place on this green earth. It is perhaps the only place in the world where he can relax and be himself — where he can amble down Innes Street like any private citizen, stopping to chat at will with any old friends he happens to meet. Sidney Blackmer, one of Broadway’s brightest lights and no slouch when it comes to movies and TV either, has been ‘written up’ by the most capable journalists in America. This piece by a country reporter, however, is concerned primarily not with the actor but with the man who still lives within half a mile of the house where he was born in Salisbury … the father who wants his two fine sons to grow up in the same healthy environment … the man who apparently has more pride in the achievements of his forebears than in his own … and the Salisburian who wants to be buried in his native Rowan when he dies. That is the Sidney Blackmer I met recently in a rambling and charming, but entirely “un-Hollywood,” old home on Salisbury’s South Fulton Street, for a one-hour interview that stretched into two hours and a half. The man’s completely casual existence in Salisbury amazed me from the beginning, even before I set out to make his acquaintance. Just as casually as if you had asked about a local barber or insurance agent. With some limited experience at interviewing “names” in show business, you know how inaccessible most of them are — unlisted phone numbers, formidable bodyguards and 10-foot fences around their homes, to name just a few of the obstacles to be hurdled. With Blackmer it’s different. You simply look him up in the phone book and give the operator his number. In this case the great man himself answered the telephone. In a pleasant, Southern voice that has tempered somewhat by the theatre, he assured me that he would be happy to talk with me at a mutually-agreeable time. And what a talk it was! The main question, of course, was why would a man whose chief business interests are in Hollywood and New York maintain a home in Salisbury, where he can spend only a few weeks each year? The unspoken answer is soon very obvious — Sid Blackmer loves the town where he was born. He never wants to sever the ties that have endeared it to him since childhood. He loves the people down here, and he knows that his hometown friends like him for himself and not for any measure of fame and fortune he has made elsewhere. You can talk to him about the theatre for so long and share with him the exciting experiences of his days on the old silent movie screen. When he talks, you can almost see Mae Busch, Will Rogers, Pearl White and the other immortals of the old days come to life before your eyes. But invariably he comes back to the things you know are dear to his heart. The large portrait of his late mother — a strikingly handsome woman — smiles down from a wall, and he begins to talk about her and the old days of Salisbury. He tells about the family home where he was born a few blocks away. It was demolished somewhere along the line when the city was suffering from growing pains. “They cut down all those beautiful trees that used to line the street,” he recalled sadly. He tells you about his father, the late Walter Steele Blackmer, who was prominent in mining, real estate and timber interests around the turn of the twentieth century. Sidney was sort of expected to perpetulate the family’s place in legal circles. He inherited his grandfather’s law library; and he actually studied law at the University of North Carolina, but that career got side-tracked somewhere along the line. You get back on the subject of movies and plays and the more recent television roles; and Sid tells how he used to ride the range on Staten Island (many movies were made in New York and New Jersey in the early days). About the time his horse stepped into a gopher hole and knocked him out, and how he woke up in the arms of pioneer movie serial star Pearl White. They had taken him to Miss White’s dressing room (the star was the only one in those days who rated a dressing room) and he vows that his return to consciousness was one of the first real disillusionments of his career. He tells about the time another actor fired a blank cartridge right into his face, imbedding powder and wadding in his skin, including his eyelids. There were no studio doctors standing by as they do today, so members of the crew picked out the flecks of powder with a pocket knife. Then once more the talk comes back to his family, and you learn that his mother was the former Clara DeRoulhac Alderman. Her father was the first and youngest signer at the secessional convention in Florida that led to formation of the Confederate States of America. He was also the last survivor of that convention. Back to shop talk, Sid tells about the first color movie Warner Bros. ever made (he was in it) entitled “The Great Divide” but changed before release to “Woman Hungry.” That was in 1931. The film is now considered lost. They wound up abandoning their Mt. Whitney location and a set for the scene was built on a Warner Bros. soundstage. It was during the shooting of this same movie that Sid fell off his horse another time, landing in the middle of a huge cactus. As a result of the piercing thorns, both of his arms swelled until they were as large as his legs, but he had to remain on location and finish the day’s work before he could return to civilization and seek medical help. 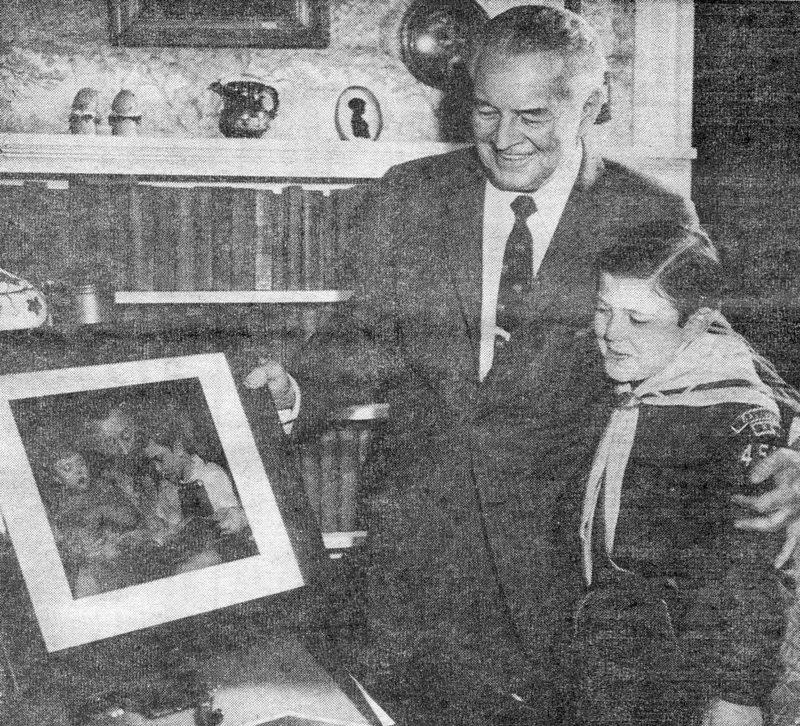 During the course of his narration, Mr. Blackmer paused by a photograph of himself, his sons Brewster, 11, and Jonathan, 8; and his lovely wife Suzanne. “Isn’t she a beautiful woman?” he asked as though he had just discovered it for the first time. Suzanne Kaaren, whom he married fourteen years ago, is a Broadway star in her own right — as you would know if you have followed the New York stage for a number of years. She was in New York at the time of my visit but was expected back in Salisbury soon. The Blackmers maintain residences in both places, but they have no home in Hollywood where Sid does a lot of work. Aside from revealing him as a man with a deep-rooted affection for his childhood home and friends, the interview also proved that Sidney Alderman Blackmer is an individual with a warm personality and a genuine love of life. Fortunately, Mrs. Overcash also saved “next week’s” issue, so it, too, will be shared. Thanks, Mrs. Overcash for hanging on to the newspapers. And thank you, Davey, for parting with them. My good friend Davey Overcash came across a stash of newspapers his mother had saved since the 1950s, a couple of which contained a profile of Salisbury’s own Sidney Blackmer. Blackmer chose acting for his career a century ago and during his 60 years in show business, conquered every aspect — radio, motion pictures, television and the legitimate stage. It was live theater he enjoyed the most. I thank Davey for passing the newspapers on to me, and I’m happy to pass them on to you. 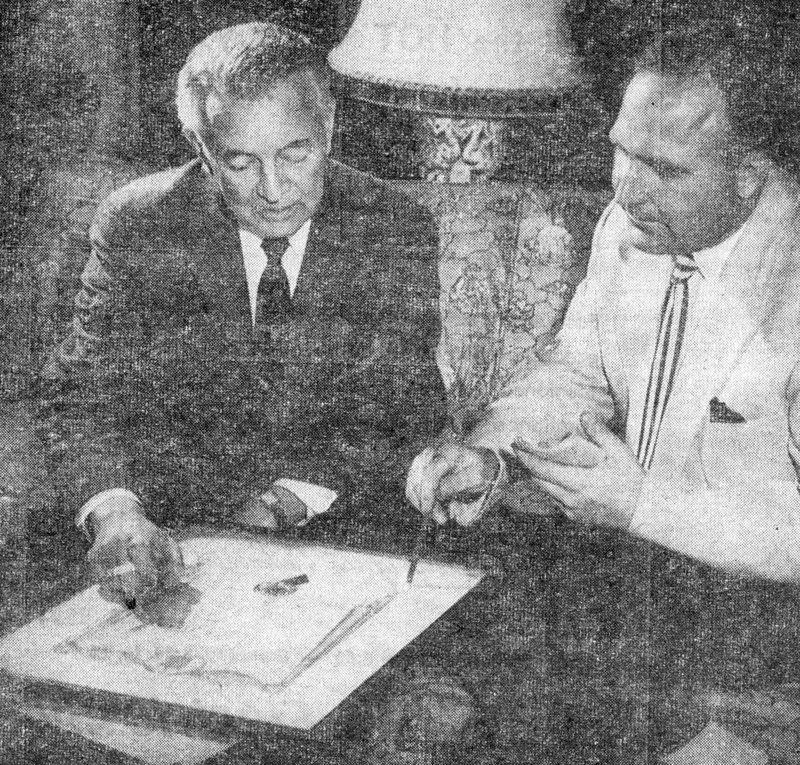 The two-part article was first published in the Feb. 17 and 24, 1957, editions of The Daily Independent Magazine and was written by Bill Maultsby. Part One appeared in last Sunday’s Salisbury Post. What follows is the concluding half of that interview which took place nearly 60 years ago. When Broadway, television and motion picture star Sidney Blackmer walks down the streets of his native Salisbury, he is always recognized by young and old alike — but no one ever makes a fuss over him. “Good morning, Mr. Blackmer,” is the polite greeting he usually gets from the youngsters. “Hello, Sid,” is the way the older people speak. This is the procedure if the people are acquaintances, or if they are total strangers. When the veteran of the New York stage (and of the old silent movies) attends a local meeting of Rotary, Civitan or other civic groups as a guest, he is recognized in the usual way among other visitors present. They never single him out as a famous personality of stage, screen or television (which he certainly is); and they never ask him to make a speech. This casual treatment is one of the things that makes Sid Blackmer’s old Southern estate on Fulton Street a refuge from the bustling, complicated life of Hollywood and New York. It is one reason he has taken the time to see that both of his children were born in Rowan County and will grow to manhood here. It also has a bearing on his continued membership in St. Luke’s Episcopal Church in Salisbury and the fact that he always comes home to vote. Although he would probably be reluctant to say so, it is likely that Sidney Blackmer has signed more autographs over the years than Elvis Pressley, Pat Boone and Bill Haley combined — yet he says he can’t remember ever having signed one in Salisbury. In New York he can’t step into an elevator or a taxi without being asked for an autograph by the operator. Some of these people can spiel off all the roles he has ever played on Broadway and television, and he finds himself wondering how they ever get the time to see so many shows. Once in the Arizona desert he stopped at a lonely gas station at 2 a.m. to make a phone call. As he stepped into the booth he became apprehensive as he realized the attendant was alone and might mistake him for a holdup man and slug him with a wrench. At home in Salisbury where the pace is a little slower, Sidney takes great pride in his home and children — and in various mementoes, some of which have been handed down from past generations. The Salisbury native attended prep school in Pennsylvania before entering UNC to study law. While at Carolina he was a member of the old University Dramatics club, forerunner of the present day Carolina Playmakers. He also belonged to the glee club, was associate editor of The Tar Heel and would have played on the football team had it not been for an injury. When he finished at Carolina, he was too far gone to enter anything so tame as a law practice, so he moved to New York and “lived in a trunk” for a few years, taking whatever roles he could get and gradually building a name for himself. Once while on tour Sid lost an entire wardrobe when theatre workmen dropped his trunk on the street — smashing it and allowing a drenching rain to soak the clothing. The theatre manager refused even to consider reimbursement. 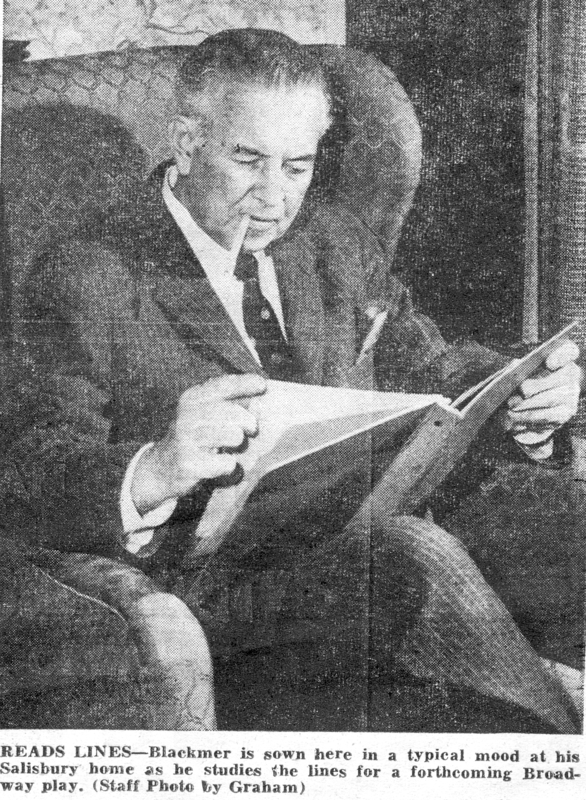 Sid answered the criticism with a letter taking Wolcott to task, and the critic published the letter. This was all right except the word vicious came out “viscus.” Wolcott commented in print that “the man can’t spell any better than he can act,” or words to that effect. In 1928 he met and married Broadway actress Lenore Ulrich. He had a part in David Belasco’s “Mima” in which she was the feminine lead when they met. They divorced in 1939. Over the years Sidney Blackmer has garnered more honors in the theatre but finds it difficult to choose any single play that he considers his greatest work. However, he seems to have enjoyed as much as any part his portrayal of Theodore Roosevelt in an early story about the Rough Riders at San Juan Hill, and he admits this is quite a concession for a staunch Democrat like himself. His greatest challenge came when he played the male lead in “Come Back Little Sheba” on Broadway. For his performance he scored a “first” in the theatre by taking all three of the coveted honors of Broadway. These were the “Tony,” the Billboard Donaldson award and the Broadway equivalent of the motion picture academy award. The Donaldson is rated highest of all. With all his honors, though, he treasures as much as any an honorary membership in the Rowan County Chamber of Commerce — presented because of his loyalty to his own community. Some years back he was honored nationally as Father of the Year — a title he says he doesn’t deserve. The fatherly twinkle in Blackmer’s eye — for all his years on the stage — gave away his stern countenance. The boys attend the public schools in Salisbury because they like the friendships and the activities. They did attend a private school in New York one year, and Sid said that it cost him more than his own college education. While Brewster’s life ambition is still an unknown quantity, Jonathan makes no bones about his — and it has nothing to do with acting. Like many other eight-year-olds, he wants to join the Air Force and be a pilot. Notable among Blackmer’s movie performances was that given in “The View From Pompey’s Head.” During rehearsals for that one, he was often mistaken for the story’s author. While recuperating from an illness just prior to the rehearsals, he had grown a beard. If you saw “Beyond A Reasonable Doubt” when it played in Salisbury a couple of weeks ago, you may remember Sid in the part of newspaper publisher Austin Spencer. That was one of his excellent supporting roles, which is the only type Hollywood part he seeks. Broadway is his main cup of tea; and he says he has never sought stardom in films — they are convenient potboilers that keep a live theatre actor eating between plays. “They seldom mention the theatre,” he complains. When one of Sidney’s movies opens nearby, it is treated just as casually as are his personal appearances. It probably never occurs to the movie goer that the two youngsters seated down in the “peanut gallery” might be the sons of the man on the screen. Sidney Blackmer’s attachment for his native Rowan County has been rather expensive at times — and amusing in a way. 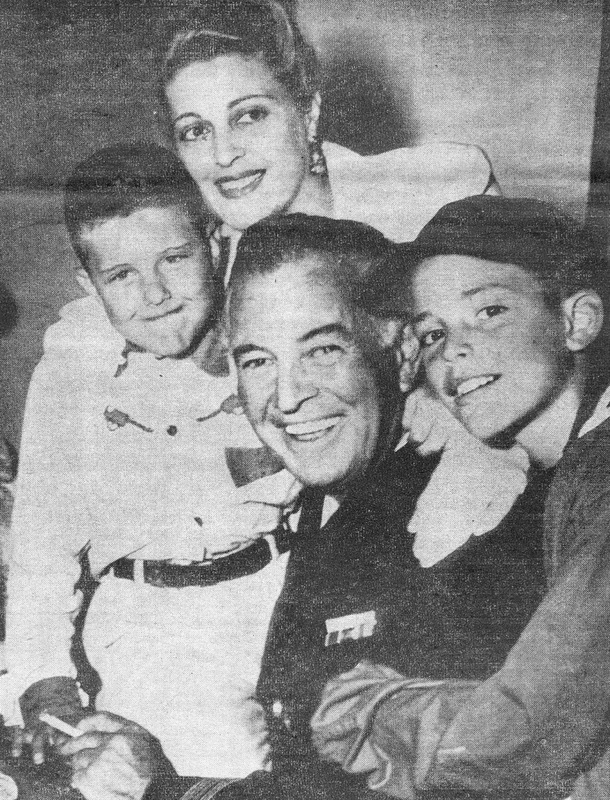 He took great pains to see that both of the boys were born here — this meant that actress Suzanne Kaaren (Mrs. Blackmer) had to run a close race with the stork to make it on one occasion. Then there was the the time the couple came home from New York to vote in the Presidential election. He cast his ballot for Adlai Stevenson and she voted for President Eisenhower. The irony is that both could have stayed in New York, and the overall result would have been the same. While he finds “co-existence” quite workable with a wife who “likes Ike,” he is personally the staunchest of Democrats. He did a turnabout on Stevenson and obtained an autographed portrait of the two-time presidential candidate. From the old days of pioneering in the silent “shoot-em-ups,” to his more recent pioneering in television, there has been one part above all others he has wanted to play. That role is the life of Robert E. Lee. Symbolic of his loyalty to the South in general and Rowan County in particular is his admiration for the late valiant leader of the Army of the Confederacy. It is easy to understand, then, why he was more than a little upset when fellow actor Paul Douglas lambasted the South over in Greensboro a couple of years ago as “a land of segregation and sow belly.” Blackmer was one of the first people to see Douglas (a close friend, by the way) after the actor’s statement. He cornered him in a dressing room and gave Douglas a pretty good piece of his mind. Among other things (including some that aren’t printable) he asked Douglas what he knew about the South other than what he had seen at airport waiting rooms and train stations. Like many celebrities of show business, Sidney Blackmer has found that a famous name has its drawbacks. He was once threatened with a paternity suit and actually had to go to court on another. In both instances the alleged victims were perpetrating hoaxes, and fortunately he was able to prove it. The Salisburian has some rather outspoken opinions about Communists in show business and elsewhere. To say that he doesn’t like them would be putting it mildly. He serves as chairman of the blacklisting committee of the American Federation of Television and Radio Artists, and the committee takes some strong stands on the subject of Reds within the ranks of the organization. One standing policy is that any member who hides behind the Fifth Amendment is kicked out. Blackmer is not under contract with any film or theatrical company and does not plan to tie himself up. As a free lance, he is able to accept or reject any parts offered. He is not stereotyped to any particular role either. While mature enough to take on practically any part where age is an asset, he is still youthful enough in appearance and outlook to play a romantic lead. At present he is reading for a part in a proposed Broadway play about Whittaker Chambers and Alger Hiss to be titled “Labyrinth.” He would have the part of Hiss if the play is eventually produced. Outside his own acting career he has one business interest — half ownership in a theatre in Hinsdale, Illinois. There was an opening night party scheduled at the Stork Club following the performance, but you may be sure Sidney first made a trip to a nearby soda fountain with his two favorite admirers. There has been no attempt in this story to write the life of Sidney Blackmer — it would take volumes to do that. What has been attempted is a personality sketch of one of Rowan County’s favorite sons, and your reporter hopes you have found this neighbor as warm and human as he did. Some may not agree with Mr. Blackmer’s statements and beliefs he gave in this interview. But keep in mind that Blackmer was born in 1895, just 30 years after the end of the Civil War. He, like all of us, was a man of his time. Our society and political climate was a lot different when he grew up than it is today. The same can be said for 1957, when Bill Maultsby spoke with the actor. I had the pleasure to spend a little time with Sidney Blackmer four times, all in his final years. I wish I could have spent more. The final curtain fell last night for actor Sidney Blackmer. The Salisbury native and life-long resident died at the Sloan-Kettering Institute for Cancer Research in New York City. He left Salisbury about a year ago to live at his New York apartment while taking cancer treatment at the Institute. He was an outpatient at the clinic most of the time before his death. A funeral service will be held at the Frank Campbell Funeral Home in New York City Wednesday at 11:30 a.m. The body will be shipped to Summersett Funeral Home in Salisbury but the time has not been set for the funeral to be at St. Luke's Episcopal Church. Burial will be in the Chestnut Hill Cemetery. Mr. Blackmer is survived by his widow, Suzanne Kaaren Blackmer of 112 South Fulton Street; two sons, Brewster, who lives on the coast of Spain; and Jonathan, of Salisbury and Durham; a brother, Luke, of Charlotte. Sidney Alderman Blackmer was born in Salisbury July 13, 1895, the son of Walter Steele and Clara De Roulhac (Alderman) Blackmer. He was graduated from Salisbury High School, the Liberal Arts Academy at Warrenton and from Mercersburg, Pennsylvania Academy in 1912. He attended the University of North Carolina from 1913 to 1915 and is counted as one of its most distinguished alumni. Mr. Blackmer was awarded the honorary doctor of letters degree from Catawba College in 1959 and the honorary degree of humanities from the University of North Carolina in 1964. While his professional acting career on Broadway started 56 years ago, his career predates this. His first stage appearances were at Mercersburg Prep and later at the University of North Carolina. He appeared professionally in "The Trail of the Lonesome Pine" in Charlotte in 1914. From his obscure North Carolina start, Mr. Blackmer went right to the heart of the theatre world in New York City. His first role in New York was as the Young Man in "The Morris Dance" in February, 1917. From then on he was constantly in demand for roles of the widest variety. He appeared in supporting and lead roles in comedies, mysteries, Shakespearean plays, revivals, one-acts, touring summer stock companies and other theatrical productions. His handsome looks made him something of a matinee idol in New York during the 20s, yet he played character roles with the greatest of ease. All of his credits are too many to list, but among the better known plays he appeared in are "The Rivals," "Scaramouche," "The Red Mill," "Chicken Every Sunday," "Come Back Little Sheba," "Country Girl," "All My Sons," "Inherit the Wind," "Dear Ruth," and "Sweet Bird of Youth." He attained star status and a prominence at that time greater than any other North Carolina actor ever had. But as significant was the steady improvement in his acting abilities, it was a skill that never left him until the end. He appeared with many of the noted actresses of their time, including such "names" as Eva LeGalliene, Grace Kelly, Shirley Booth, Madge Kennedy and Helen Hayes. In fact, his first marriage was to one of them, Lenore Ulric, a leading Broadway actress. They were married from 1928 until 1939. But as he was on the stage, he was able to maintain a secondary and parallel career as a film actor. His final screen appearance was a lead role in 1968's "Rosemary's Baby," for which he received some support for an Oscar in his supportive role. His first movie appearance was in the classic 1914 Pearl White serial "The Perils of Pauline." Later roles followed in such features as "The Count of Monte Cristo," "The Little Colonel," "Duel in the Sun," "Saturday Hero," "The High and the Mighty," "High Society," "View From Pompey's Head," and "Joy in the Morning." Coming later in his career, television played a role in his life and he appeared in many series such as "Bonanza," "The Outer Limits," "Alfred Hitchcock Presents," "The Rifleman," and dozens of anthology series, many presented live. His finest professional honor came for his 1950 role in Broadway's "Come Back Little Sheba," for which he won both the Antionette Perry Tony Award and the Donaldson Award for being the finest actor of the season. He also received the National News Reel Award for a short film about Teddy Roosevelt., the West Coast Critics Award, Father of the Year Award, and North Carolina's Distinguished Citizens Award for his contributions to the arts. While he was interested in a wide variety of subjects, Mr. Blackmer became increasingly involved in the work of the National Muscular Dystrophy Foundation and was recognized for his efforts recently. He was also involved in the development of the North Carolina School of the Arts in Winston Salem and served it in an official capacity. He kept Salisbury as his true residence all of his life, insisting his heart remained here although he had lived in many parts of the world. During the periods between plays and other engagements, he lived in Salisbury while "at liberty" and could be seen frequently chatting with friends uptown or watching local sports events. His family lived and was reared at the historic old home on South Fulton Street, although he was frequently on the road performing. Donald Trump may have said it best when it comes to Suzanne Kaaren Blackmer. "He said in a letter that all of the people in his building, the one he should know was me," Suzanne explained from her home in the New York building Trump owns. "He became a friend." Turns out Donald and I have something in common: Of all the people who've lived in Salisbury over the past century, one I'd like to know is Blackmer. She and actor husband Sidney graced the first block of South Fulton Street with their celebrity status for years. In a voice lilting with old-fashioned grace and charm, she reminisces during a phone conversation how they met and ended up here. Sidney's family, she said, became the third set of owners for the Fulton Street house built in 1820. "It was the first townhouse built in Salisbury," she said. "Sidney loved the house." As luck would have it, the house eventually fell into Sidney's hands, and he brought his young wife Suzanne here to live. The couple met in Santa Clara, California, during the first half of the twentieth century. Both had active roles in entertainment. His talent for theatre would lead him to Broadway, a movie career, a radio career and a television career. Her talent would open doors of opportunity as she demonstrated her flair for stage dance, later movies and television. "I was one of the first members of live television," she said, "because I had been trained in theatre." Her movie credits include working with Spencer Tracy, Preston Foster, Claire Trevor, George Burns & Gracie Allen, Bing Crosby, Ethel Merman, William Powell, Frank Morgan, Ray Bolger, Myrna Loy, Fanny Brice, Adolphe Menjou, Johnny Mack Brown, Joe E. Brown, Joan Fontaine, Marlene Dietrich, Herbert Marshall, Melvyn Douglas, Tim McCoy, Jeanette MacDonald, Nelson Eddy, Fredric March, Ralph Bellamy, Joan Bennett, Norma Shearer, Clark Gable, Gene Autry, Smiley Burnette, Robert Young, Joan Crawford, Paulette Goddard, Rosalind Russell, Marjorie Main, Bela Lugosi, Ann Rutherford, Billie Burke, Wallace Beery, Gregory Hines and Richard Gere. Not too shabby. She also appeared with The Three Stooges in three of their comedy short subjects. As Suzanne described those early days of show business, the excitement that tinged her voice left no question that she enjoyed them. But once in Salisbury, she would make a decision that would reshape her life. "I was Suzanne Kaaren all through my career," she explains without remorse, "but I stepped aside and let my husband continue his career so there wouldn't be any competition." Her new focus would lie more in raising their two sons and settling her household into the community she would call home for the next fifty years. And in her spare time, she'd help Sidney nail down his lines for whatever his next acting project might be. "It was wonderful supporting my husband," she commented during our conversation. "He told me nobody knew how to cue an actor like I did." After Mr. Blackmer's death in 1973, she wanted desperately to do something in Salisbury to honor his memory. She decided to try her hand at establishing a Sidney Blackmer museum. "I wanted to be curator," she explained. "I had several very good people who were crazy about the idea and who put money in an account for the project. But finances eventually dwindled," she said. A 1984 fire that "started with a bad connection of electricity" destroyed the interior of the Blackmer home, and a few years later Suzzane left the remains in the care of neighbor Ed Church and moved to her apartment on Central Park in New York. While she "truly, truly loves Salisbury," she says she has no plans to return. Age is her main obstacle. "I'm too old," she rationalized simply, "but Salisbury was more my home than any other place in the world" largely because of the special memories it holds for her. "Those times sitting on the porch," she mused, "with that first little baby in the carriage or rocking with Mama, who would say, 'Not even a leaf is stirring'...Those moments touched me. I would love to sit on that porch and rock alongside you for a long-overdue visit. I wish you'd come home and take your place in Salisbury's history. The final curtain fell at high noon yesterday for Suzanne Kaaren Blackmer, actress. That's similar to how the Salisbury Post announced the death of her husband, Sidney Blackmer, when he died of cancer in New York in 1973. A Salisbury native and life-long resident, Sidney Blackmer made theatrical history in "Rosemary's Baby," won a Tony Award for "Come Back, Little Sheba" and brought the glamour of the New York stage and Hollywood ---and Suzanne--- to Salisbury. 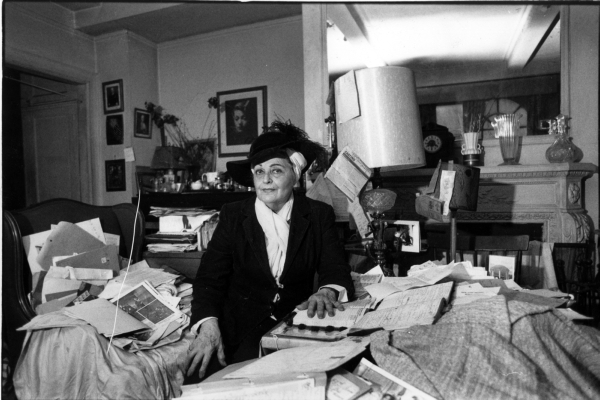 And she kept that glamour here after his death, even after a fire mortally damaged the historic family home at 112 S. Fulton St. in December 1984 and forced her to make her permanent home in the apartment she and her husband had rented since the 1940s on New York's posh Central Park South. 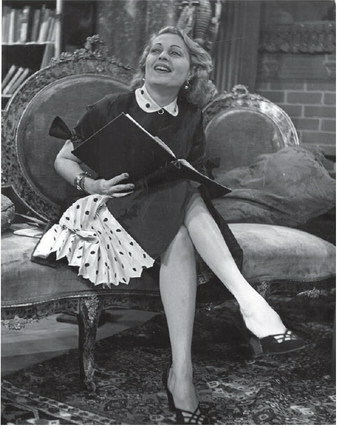 Even after her active life as an actress in leading roles and supporting parts on the stage and radio and more than 66 movies were over, Suzanne Blackmer, whose legs were once insured for $1 million, remained a flamboyant actress in all she did, including a very public and lengthy running battle with New York's famed Donald Trump about that apartment. But illness forced her to leave her apartment ---temporarily, she hoped--- last January. After all, said her son, Jonathan, who grew up at the Fulton Street home in Salisbury and is now a Washington lawyer, she was 92, even if she didn't look or act her age, and a 92-year-old has the right to get sick. She had pneumonia. He went to see her, put her in the hospital and when the pneumonia was under control, took her to the Lillian Booth Home of the Actors' Fund of America in Englewood, N.J., for rehabilitation. It's the same facility Jonathan says, where "Dad gave benefit performances throughout his entire career." She got better, and occasionally she talked in that still lilting and heavily punctuated voice that was like no other to old friends in Salisbury about going back to the apartment in no time. Except she didn't make it. She died yesterday at the Lillian Booth Home, leaving two sons, Jonathan of Arlington, Va., and Brewster of Spain; and a grandson in Spain. But she, like Sidney, wanted to come back to Salisbury for eternity, and she will be buried in a double depth and, until now, unmarked grave with her husband in Chestnut Hill Cemetery. But it will be unmarked no longer. The stone has been waiting ---and will be engraved with a traditional theater stage manager's command: "Quiet, please, the curtain's up!" Jonathan knows exactly when he learned that's what it had to be. "I remember having the conversation with my dad in New York," he says. His dad was at New York's famed Sloan-Kettering Institute for Cancer Research, where he was being treated for the disease. "I don't remember if a friend had passed away or what," Jonathan says, but Sidney repeated the line, "and he said just before he passed away, 'That's what I want.' I had made some reference to a line from Shakespeare, and on his deathbed he corrected me. Suzanne wanted to be buried here, too, though she was a native of Brooklyn, N.Y.
Born March 21, 1912, to Phillip and Helene Krause Kaaren, she became involved in the stage and athletics early, according to her son and a newspaper article he found recently in her apartment. Headlined "Suzanne Kaaren, Athlete, Skyrockets to Film Fame," it was a biographical sketch apparently written when she finished two films for RKO and Universal Studios after having been under contract earlier at 20th Century Fox and MGM. Her "unusual athletic talents," the article said, were discovered when she was a student at Hunter College. "Without effort, she jumped 4 feet and 4 inches, only 2 inches below the world record," the article said, and with a little training, she shortly broke the world's record. And it was her first experience in the limelight, the article continued, when she won the honor of representing the United States in the women's high jump in the Olympic Games in Berlin in 1936. She pulled out because of her mother's objections. But her real role was as an actress, an actress who never won a Tony like her famous husband but played in scores of movies when she was Suzanne Kaaren and as Suzanne Blackmer after she married Sidney in a secret ceremony in Hollywood in June 1943. She was a famous actress in our midst. The Post files show she played leads and supporting parts in more than 66 movies, including "The Great Ziegfeld," "The Great Gatsby," "Meet Me in St. Louis," "The Women," and "The Cotton Club," which had just been released and was showing in December 1984, when fire blazed in the Blackmer home. OK, so her small speaking part in that movie amounted to 38 frames of film that lasted two seconds, but her profile framed the right edge of the screen, and it was work for pay, at an age when an actress got little work. Through the years, she worked with Walter Matthau, Robin Williams, Woody Allen, Judy Garland, Van Johnson, Clark Gable, Joan Crawford, Norma Shearer, the Three Stooges and countless others. And oh! That kiss from Clark Gable in 1939's "Idiot's Delight" was never to be forgotten. The King had a cold, and the kiss required 21 takes before they got it right. So, you guessed it, she got his cold. She and Sidney considered Salisbury home, raised their two sons here. After Sidney's death, she was usually here or in New York at the apartment which the couple rented in 1945. And then came trouble to remind friends that the first movie appearance Sidney made was "The Perils of Pauline" in 1914. Had Suzanne become another Pauline, without a Sidney to rescue her? First, he died. Then came the 1984 Salisbury fire. Then, no money. Her matinee idol husband left her their large home in need of paint and central heat but no way to pay for either. The estate his star-studded life had produced had been decimated by his final, fatal fight with cancer and unfortunate investments. Her efforts to repair the house were intense, but minimum and ultimately fruitless. Her fights with Salisbury city government ---and the neighbors--- to keep it from being demolished were continuous. Living in the still-whole garage behind the house meant sharing its minimum space with the memorabilia of bygone days, the old costumes, the many books, the pictures. Pipes froze in winter. She showered at the YMCA. Within a couple of years, she was back in New York at the apartment she and Sidney had rented when he was at the height of his stage career and Suzanne was the girl whose legs were the "Toast of Broadway." Her address at 100 Central Park South was the address in New York. She said good morning to the statue of Simon Bolivar, who guards the entrance to Central Park and watched the horses and carriages parked beneath summer's sheltering trees or stroll around the corner to Tiffany's. But her rent was only $203.59 a month because of New York rent controls, her age and her income, which was less than $10,000 a year from a Social Security check, a small Actors' Guild pension and occasional work as an actress. Then entered Trump, that flamboyant New York billionaire, who had invaded TV with a blustering refrain, "YOU'RE FIRED!" Back then he was playing New York, some said, like some people play Monopoly, and he bought the apartment building she lived in. Other apartments on the same street with the same view rented for $5,000 a month. One just like it a story above Suzanne recently sold for $1.5 million. Her battle with Trump was history-making. In the late 1990's, Trump was, well, trumped. Marc Finklestein, a prominent law professor at Brooklyn Law School and director of the Brooklyn Legal Services Offices for Senior Citizens, recognized in her story a central theme familiar to the ages, a oneness with David and Goliath, Little Red Riding Hood and the Big Bad Wolf. He saw not only a faded actress and widow about to be thrown into the streets of Manhattan, but also a Joan of Arc riding into battle against Trump. In 1998, the court decided Trump could turn the apartments into condos and sell them ---Suzanne's was assessed at $750,000 then--- or the renters could stay --- with rent control. Suzanne stayed until she got sick last winter. She was also rundown, Jonathan says, and when the pneumonia was under control, he took her to the Lillian Booth Actors' Home. People here who knew his mother, Jonathan says, know she saved things ---"old dresses, old hats, posters, papers, all the photographs and letters his parents wrote when she was known for her achievements as a Radio City Music Hall Rockette and for all the contributions both of them made to the arts in this country, especially Dad with the N.C. School of the Arts and his own career." Sidney Blackmer was considered one of the founding fathers of the North Carolina School of the Arts. Then there was Suzanne's fan mail. "Just a few days before she got sick, she got a fan letter from a man who was an usher at Radio City on Dec. 27, 1932, and remembered her first performance as a Rockette." Just before her death, she received a couple of e-mails from a fanatic fan of The Three Stooges, with whom she appeared three times. Before his mother got sick, Jonathan says, she enjoyed "sitting at her front window looking out at Central Park and checking on the cabs and horses and watching the world pass by." Only her death has returned the apartment to Donald Trump. "I don't walk to talk about the apartment now," her son says. "I've still got a lot of things to do there. Mother has what would be considered a life estate in the property after her battles with Trump because of New York law, but there were no succession rights to family members." "So I'll abandon the property as soon as I have a reasonable opportunity to remove the important memorabilia that's still there. I've had no contact with Donald Trump. It's an important apartment, certainly worth fighting over, but I'm not ready to get in that fight. I've got no dog in that fight." But he'll never forget it. "Mother was a New Yorker," he says, "and my earliest memories of childhood are of that apartment." And when she died, she no longer owned the house on Fulton Street in Salisbury. Because she had no money for repairs, Historic Salisbury Foundation stabilized it after the fire, put a new roof on it and offered to buy it after she deeded it to her son, Jonathan. No deal has been struck. The foundation and the historic interests in Salisbury continue to favor preserving and protecting the house. Jonathan Blackmer has the same feelings, but he'd also like to see it made into a museum that would in some way reflect his parents' lives in the theater and movies. "It's a historic treasure," he said last winter after his mother got sick, "and if there's a way to combine the historical significance of the house and the contributions of the former owners..."
Certainly, his father's contributions to North Carolina and to American theater are not insignificant, he says "and there must be a way to combine the preservation of both." Built around 1820 by John Fulton, for whom the street was named, it later became Salisbury Academy, a boarding school for girls, and was later owned by the A.J. Mock family before Sidney Blackmer bought it in 1931. She wanted to rest awhile and go back to the apartment. But now she's coming back to Salisbury. Back to home and her memories and her beloved Sidney. "Quiet please, the curtain is up." Suzanne Blackmer always knew how to make an entrance. And handle a curtain call. Funeral services will take place September 4, the Saturday of Labor Day week, with the time tentatively set at 11 a.m. at St. Luke's Episcopal Church, 131 W. Council Street. Burial will follow in the Blackmer family plot in Chestnut Hill Cemetery. That's also the weekend of the 39th annual Jerry Lewis Labor Day Telethon for donations to the Muscular Dystrophy Association of America. "She and my dad were supporters of the Muscular Dystrophy Association, and dad was on their National Board of Directors," says their son, Jonathan Blackmer, who designated it for donations. What else for an actress who knew everything about timing?